As 2011 comes to an end, we follow up our most pirated TV-shows chart by taking a look at the most pirated movies of the year. 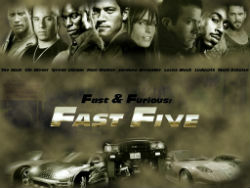 Fast Five comes out on top, and aside from other usual suspects such as box office hits Harry Potter and the Deathly Hallows Part 2 and The Hangover, the list also includes a few surprising entries and some notable absentees. With over 9 million downloads Fast Five leads our list of most shared movies on BitTorrent in 2011, leaving The Hangover II and Thor behind in second and third place respectively. The total number of downloads for Fast Five pales in comparison to last year’s victor Avatar which was downloaded more than 16 million times. This downward trend is also visible throughout the rest of the top 10, where the average number of downloads is lower than in 2010. In part this drop might be explained by the increase in legal alternatives, although upcoming alternative piracy sources (such as cyberlockers and steaming sites) may have also had an effect. However, since the total number of active BitTorrent users isn’t shrinking, the downloads may simply be spread out over more titles in 2011. As is the case every year, our top 10 lists have a few notable absentees in 2011. These include the top grossing Pirates of the Caribbean: On Stranger Tides and Transformers: Dark of the Moon. On the other hand, 127 Hours and Sucker Punch were both hugely popular among the downloading public, while their box office grosses were relatively modest. The data for this list is collected by TorrentFreak from several sources, including reports from thousands of BitTorrent trackers. All release formats, including cammed versions are counted. Afterwards, the data is carefully checked and corrected if needed.